Keep Your Hands off Keith’s ‘Stache! Great news for those of us in the NYC area, the best three-man baseball booth will be in place next year. 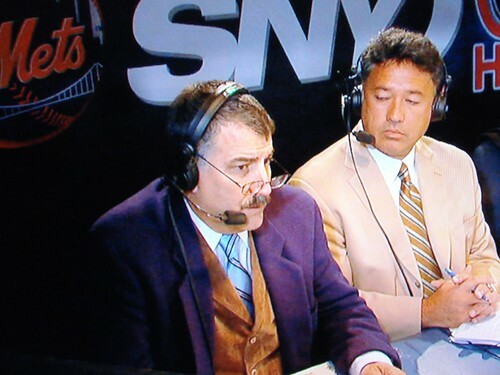 At the end of this miserable season, Keith Hernandez of SNY hinted that he might not be returning to the broadcast booth the next season. However, after negotiating his contract, reports are that Keith will be back through at least 2011. His cohorts in the booth, Gary Cohen and Ron Darling are both signed through 2010 so, let’s hope this next season goes better for the Mets and this wild three-way never ends. this will be the best mets-related signing of the off-season. well, great minds think alike. also, it’s simply the painful truth the mets faither (you, my, myummers) have come to expect and fear. Mad Hatter looks sad. Lose your hat, buddy?